Mahaffey was initially contacted by a prestigious procurement services company searching for a temporary structure to meet their project's facility blast requirements for an upcoming construction project. After several discussions, Mahaffey learned that they were not affected by API RP756 for this particular structure. 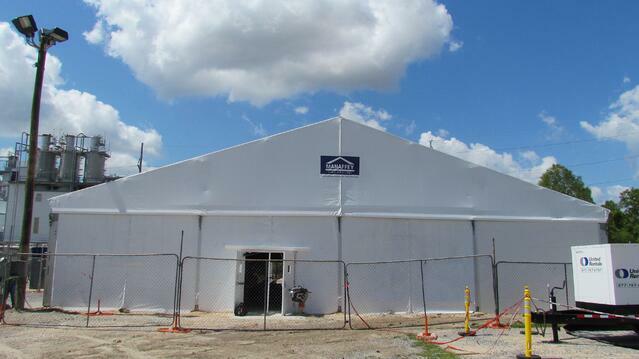 Mahaffey Fabric Structures provided a 66' x 116’ lunch facility. Our training and previous projects at area facilities enabled our customer to feel comfortable with Mahaffey’s offering. During this meeting they explained new safety procedures and their expectations of all contractors involved in this phase of construction. Challenges related to work stoppages and delays were numerous. Due to recent rainfall, the company was unable to prepare the concrete mud seal prior to our arrival. We decided to install the fabric structure before this foundation was installed. This gave them a dry environment to easily pour their foundation within. The design of the Mahaffey MegaSeries Structure allowed the customer to meet the high wind loads of the project, as well as help provide a cool, dry facility for lunch and safety meetings. Interested in learning more about blast resistant tents and structures, or want more information about how you can close the gap between wrench time and break time with Mahaffey MAX 756?